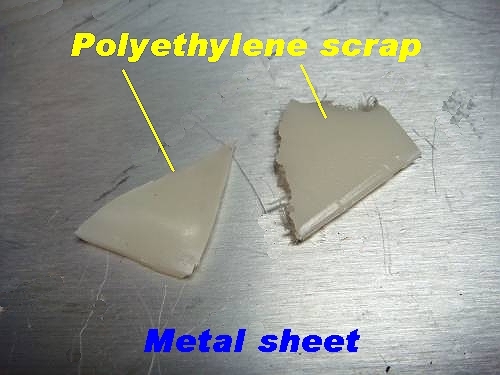 See this link for further reference: http://en.wikipedia.org/wiki/Polypropylene. In the past, most attempts to repair fuel tank damages with epoxy or other type of glues were not successful. This was mainly caused by the fact that pilots do not understand that such glues used on the fuel tank polymer (plastic) will not last. The reason is very simple: gluing in most cases and in all cases of non porous materials, will bond only the superficial layer of material. They will hold in place only because of adhesion and atmospheric pressure. But all these glues, do not penetrate in the surface of a non-porous material and do not bridge with the damaged area. It is true that there are some "plastic welder glues" that actually have a mixture of solvents and in some cases, they will bridge with the surface. But no known to me "plastic welder" that I tried, dissolves polypropylene. In such cases , the repair will be only a temporary one and such a tank will always pose the threat of leaks and possibly, an in-flight fire!! 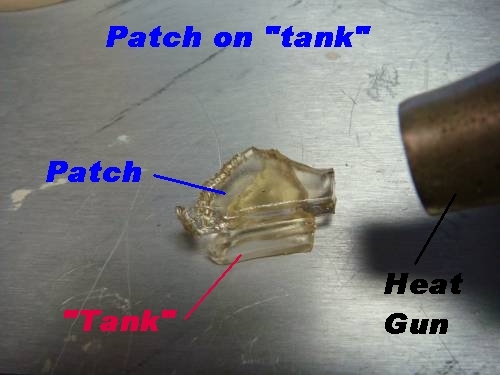 After several futile attempts from my side to use epoxy glues for tank repairs, I came to the conclusion that I must use some kind of method to make the repair material to actually fuse with the tank. That is, to make the molecules bridge. 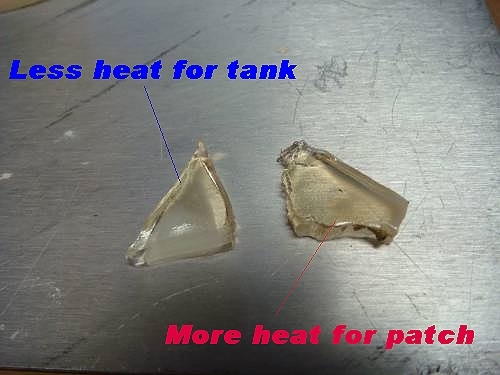 From my understanding and from different tests, I realized that if the plastic material used in tanks is thermoplastic -which it is- if heated up to a certain temperature, these materials will melt but will not change their chemical composition too much, if at all. After many successful tests and empirical measurements (since I am not equipped with sophisticated devices) I decided that this fusion if done in the right temperature range, the repair will be as strong as the surrounding, non-repaired material. 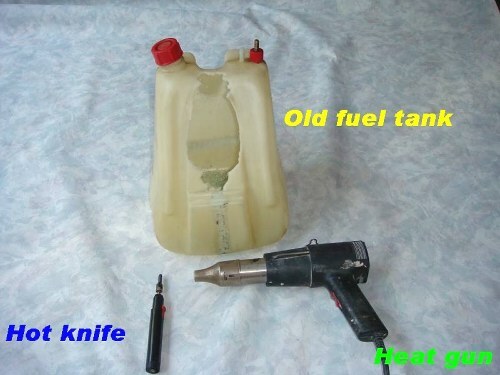 The following, is a description of such a "fusion type" fuel tank repair. We will have to use the same material as the fuel tank. I sacrificed an old leaky tankand in this case, it is polypropylene. But before doing the repair, I invite my readers to do a small test first. After many requests from pilots, I published an addendum at the end of this article to better illustrate the whole proces. Again, before reading further, please scroll down and see this addendum. Tools used: wire cutters, heat gun, hot knife and a small spoon or wider blade to smoothen the molten plastic. 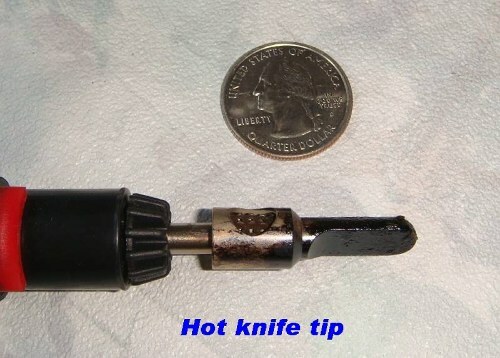 Below we see a close-up of the hot knife tip. 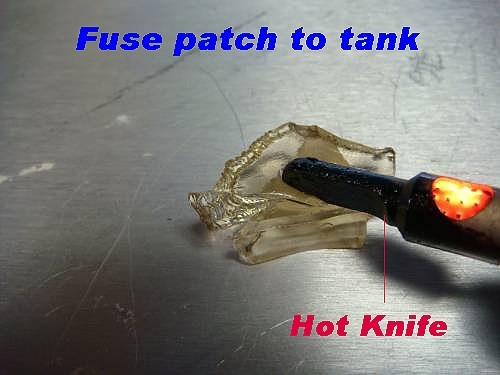 It is a butane powered tool.Using a soldering gun, we must make sure we do NOT burn the plastic. The hot knife is a better option. With a wire cutter, we cut several smaller pieces of the material we will use for the repairs. Since I performed all these operations alone, it was impossible to melt the plastic, apply it to the tank and take pictures. I will explain step by step how this was done and I will show only the raw and finished repair. 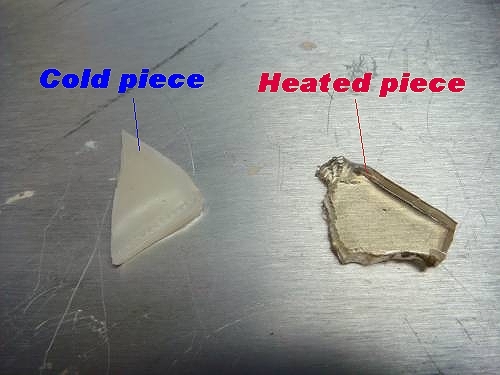 1) Prepare a sufficient number of plastic pieces for the repair. 2) On a metal surface, start heating the plastic until it becomes transparent. At this point the plastic has a putty consistency. Continue to heat until the material becomes almost tacky. If the material starts to become brown, the temperature was too high and this molten plastic should be discarded!! 3) Using tweezers, hold the molten plastic above the spot you will apply to. 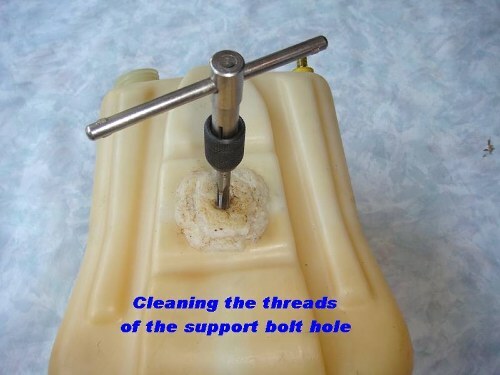 Carefully, not to melt the whole tank, blow hot air with the heat gun fitted with a nozzle (see picture above) First blow hot air on the repair surface and when it starts to become transparent, blow hot air on both surfaces. Press the soft plastic on the tank. 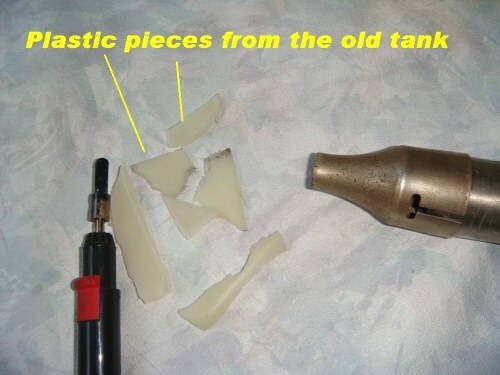 4) Using the hot knife, go through the molten plastic all the way down to touch the original surface of the tank. 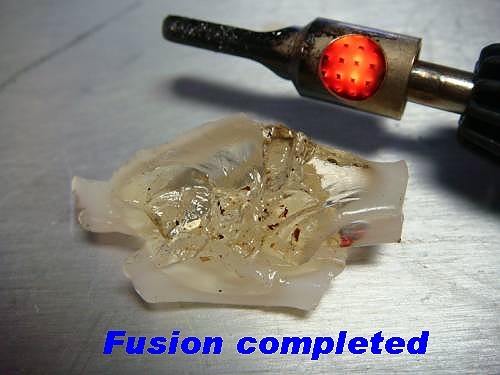 This operation is very important in order to achieve a good "fusion" and make the repair last. 5) Take the next piece of plastic and repeat the above operation until the whole damaged area is repaired. 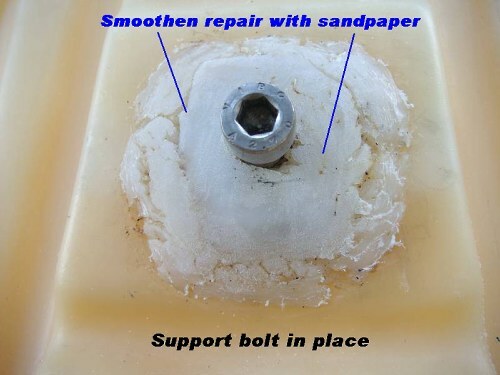 The repair on the tank shown below was done around the metal insert that receives the tank's fastening bolt. 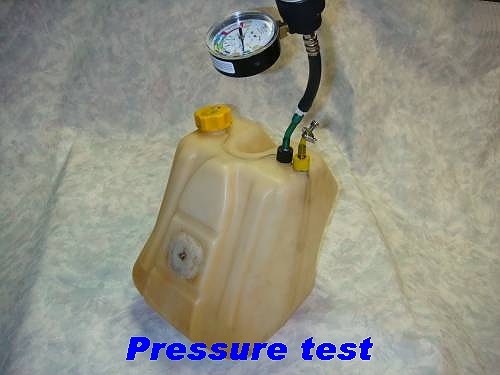 If we wish to check the repaired area for leaks, we can perform a pressure test as shown below. For better esthetical presentation, the repair surface should have been sanded more but I considered it not to be the case since this repair is on the back of the tank and it is covered by the harness. 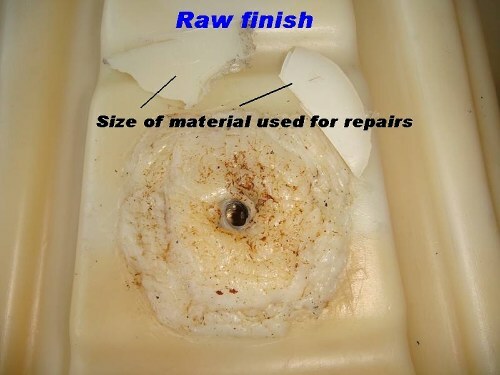 Although this type of repair works well, but the quality of the repair is beyond my control, it is the pilot's responsibility to ensure a quality and long lasting repair. Aero Coors-Air USA Inc. or me personally, will not take any responsibilities for this kind of repair. Instead, we strongly advise to replace the damaged tank with a new one. Please, be advised that a leaky fuel tank can cause an in-flight fire with the worst possible consequences!!! 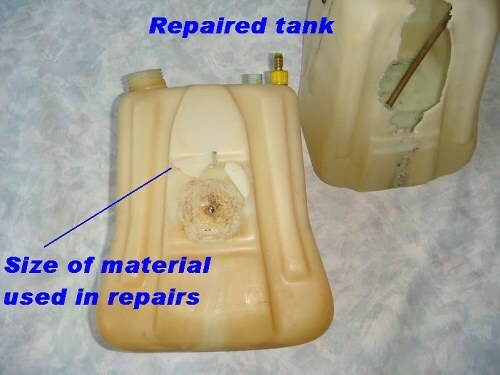 After many requests from pilots asking me to elaborate more on the tank repair, I repeated the process step by step on two polypropylene pieces so the reader of this article will have a more clear understanding of the process. The pictures are self explanatory . In the picture below, we see that using the hot knife, we push it down in the patch until we get to the tank surface. This way we ensure that the fusion is well done.